An overturned neighborhood play, delayed out call, and beneficial dugout placement at Petco Park allowed a baserunner to advance to third base following a successful replay challenge by the visiting team in San Diego. LeMahieu, at the last second, stays at third. With one out and one on (R1) in the top of the 8th inning of Saturday's Rockies-Padres game, Rockies baserunner DJ LeMahieu was awarded third base after a neighborhood play ruling was overturned from out to safe at second base, and LeMahieu innocently ended up at third base, just outside of his club's dugout. After Padres shortstop Chase d'Arnaud spun and threw while coming across second base, LeMahieu appeared to trot back towards the Rockies' third base dugout, going so far as to remove his helmet to hand to 3B Coach Stu Cole before ultimately deciding to put his helmet back on and remain on third base, as the Padres thought nothing too odd about an apparently-retired Rockies baserunner jogging in the direction of his dugout. Complicating matters, 2B Umpire Tripp Gibson did not appear to make a safe or out call until after the play was complete, and only after Padres first baseman Will Myers appeared to look toward Gibson for a ruling, which Gibson obliged by mechanizing an out call. 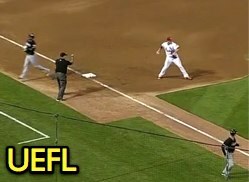 Yet, because LeMahieu stood at third base, the Replay Official awarded him third, ruling that LeMahieu had legally run the bases and advanced to third base in spite of the erroneous out call. Replay Review Regulation IV.A.3 delineates several factors to consider when placing runners, including: "(a) the depth of fly balls; (b) the speed of runners; (c) the location of runners on the field when the play occurred; (d) the number of outs at the time of the play; and (e) whether the incorrect call affected the subsequent behavior or conduct of the offensive or defensive players." Neighborhood play = Runner safe at second. For the LeMahieu play, (a) does not apply, nor should (b) as LeMahieu didn't exactly sprint to third base. 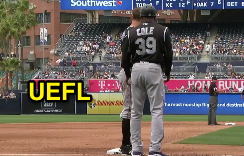 The third out precluded San Diego from attempting a play at third base (as did LeMahieu's status as having been called out at second base), though LeMahieu did physically wind up standing on third base, even if by accident. Finally, determining the incorrect call's affect on the players' subsequent behavior is complicated by the delayed out call: Myers looked toward second base, apparently unsure of what to do with no call having been made, while LeMahieu simply continued jogging to third base. Regulation IV.A.2 states, "The Replay Official shall place the base runners on the bases he believes they would have reached had the reviewed call been made correctly...Any doubt regarding the placement of runners should be resolved in favor of the last base legally touched at the time of the challenged call. More than one base should not be awarded unless it is obvious to the Replay Official that a runner would have safely advanced beyond one base had the call been made correctly, or the Official Baseball Rules otherwise require such advancement." Signal the out, even if play has left the area. Lesson learned: When building a stadium, increase that home-field advantage by placing the home dugout on the third base side of the field, and, at the end of an inning, always stand on third base. Two outs and a runner on third? Yes, please. Second lesson learned: Always make a call, unless instructed by rule or mechanic not to (such as in the immediate aftermath of a double-missed tag where the catcher fails to tag the runner, who in turn fails to touch home plate). It might seem silly to indicate a closed fist after the play has seemingly left the area, but it will prevent confusion later on as players may look back for an umpire's judgment ruling relative to a pulled foot or timing issue. As the MLB Umpire Manual states, "Umpires shall make a signal on all calls with the exception of 'ball.' Signals are to be visible, crisp, and clear. Voice calls should be clearly audible...Signals should not be slow to the point of appearing uncertain or causing confusion for the fans and media."